India is an exciting country to travel to, with an incredible cultural, natural, and social richness. But it’s also extremely vast, extremely different to the West and can be both overwhelming and draining. Even the most experienced traveller can reach their limits navigating the enormous selection available. From transport and accommodation to places to visit and travel routes, it’s quite a daunting country to experience. Because of this, we offer the flexible and preference-oriented service of creating an India trip planner for independent travellers. We allow travellers to experience a customized and unique trip, while still leaving the decision making to the travellers. Control over the decision process is given to the traveller, we only help with making your trip work to your needs. Furthermore, our extensive knowledge of India we have from travelling and planning 2000-plus trips all go into your trip. 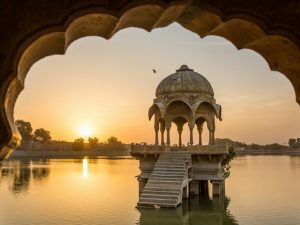 HOW DOES OUR INDIA TRAVEL PLANnING PROCESS WORK? First, we would like you to answer a few questions to make us understand how far you are into the India trip planning process. Have you decided which places to visit in India? When you’d like to come? Do you already have a travel route in mind? Are you interested in backpacking or are you more into luxury travel? What are your expectations regarding transport and accommodations in India? After your first enquiry we might have some more questions before we create a first travel plan according to the information given. You might also have some questions or doubts before you want a detailed India trip planner. In the first round of the India trip planner process we suggest a travel route, accommodations and transport while keeping your wishes, requirements, budget, travel dates etc. in mind. Afterwards, we can modify the trip plan according to your input until you are 100% satisfied. The service of trip planning is non-binding and free. You only pay a small advance after you confirm the trip plan to India before we go into booking. Only when you have received all confirmations and vouchers you pay the rest including our very fair fixed fees. So while this gives you a lot of opportunity to take part in your India travel planning process it also takes the burden of time-consuming research and bookings. See us as a personal travel guide book to India that answers your questions directly and plans a completely personalised holiday to India. Firstly, the personalised travel plan only includes accommodation and modes of travel along the travel route planned by us. This is to keep your travel experience in India as unique and independent as possible. The cost breakdown is to make sure there aren’t hidden costs, with the amount of fees, taxes and transactions included for transparency. Check out some of the varied and unique travel routes we’ve already done for some of our clients. We don’t normally include guided services or activities, we believe that it restricts your freedom in the daily travel planning. Monuments also offer audio and information tours so you can explore them at your own pace. This allows you to choose exactly what you want to see and experience. However, if you want to delve into the culture and history with the help of the locals, we can arrange for additional services. These could include city guides, monument or other special tours, cooking classes, out-door activities or even mountainous treks. But our service doesn’t end with the consultation and trip planning. We’re there before and during the trip in case you have more questions or problems on the road. We also share the knowledge we’ve obtained from numerous trips regarding sightseeing, places off-the-beaten-path and local culinary places in India. You can also read all our tips and information on a variety of things in India on our extensive blog and our Discover India page. WHAT DO WE NOT OFFER? We do not offer fixed holiday packages including international flights with fixed departures. Our trips start and end in India and are not fixed but are modified to your dates, requirements and expectations. We also don’t offer group tours for individuals to join. However, if you’re a group of friends, family or colleagues we can create a trip plan in India for you. Our service is flexible and tailored to your decisions during the planning of the trip, but we do need to book and pay for the services that you’ve chosen for your trip. This means that spontaneous changes during your trip travels in India are difficult to execute and at your own cost. We’re there for you during the entirety of the trip and cater for any needs or problems presented, but understand that at the same time we’re limited in modifications while already on the road. If you are planning to come to India and need the assistance of an India trip planner, plan your trip with India Someday. Whether you’re looking for a family holiday, a luxury tour or are backpacking through India we can take your trip onboard!